I'm sure I have many, many followers who are fans of Civil Engineering: The Magazine of the Society of American Civil Engineers. 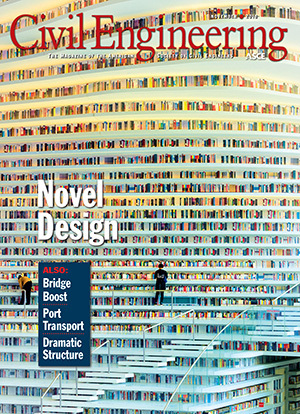 This month's issue has a cover story on a pretty amazing library in Binhai, China. Actually, it sounds as if its atrium is what's pretty amazing. also steps and walkways and seating.The upper walls with their shelves bend inward, as you can see in the picture to your left. It's pretty spectacular looking. Now, I'm no engineer. But I looked at those upper walls and couldn't see any way to get to the shelves on them. I thought, well, the shelves must be accessed from behind. Good idea, Gail. According to the CE article, that was the original plan. But they only had three years to build this thing, so the rooms on the other side of the atrium walls were ditched. 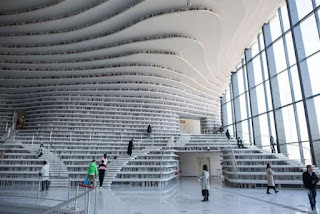 The upper shelves hold fake books. There are more traditional library rooms in the building with more books. The builders and planners were interested in creating a site for gathering, as well as for archiving books, and they've certainly done that. 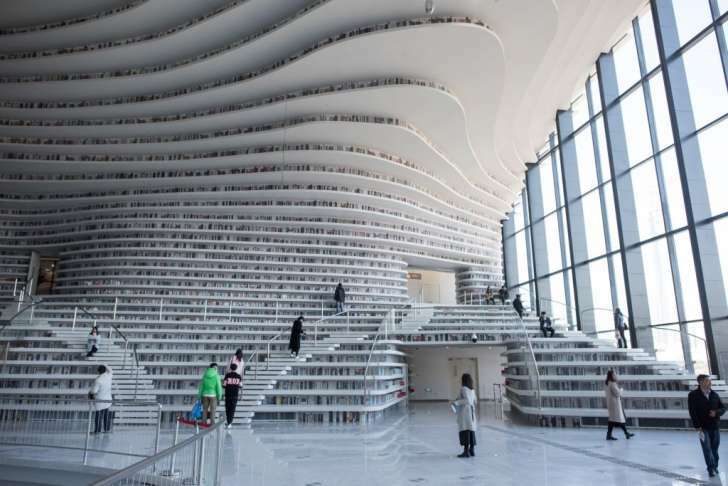 It's hard for a book person not to be excited about the way the Binhai Library turned out.